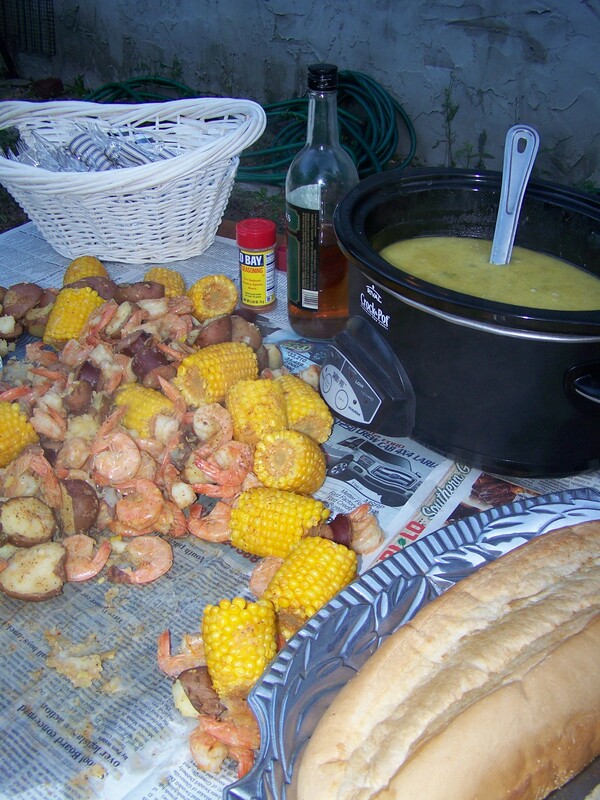 On a cool Friday night in early spring, all the conditions were right for my lakeside lowcountry boil. 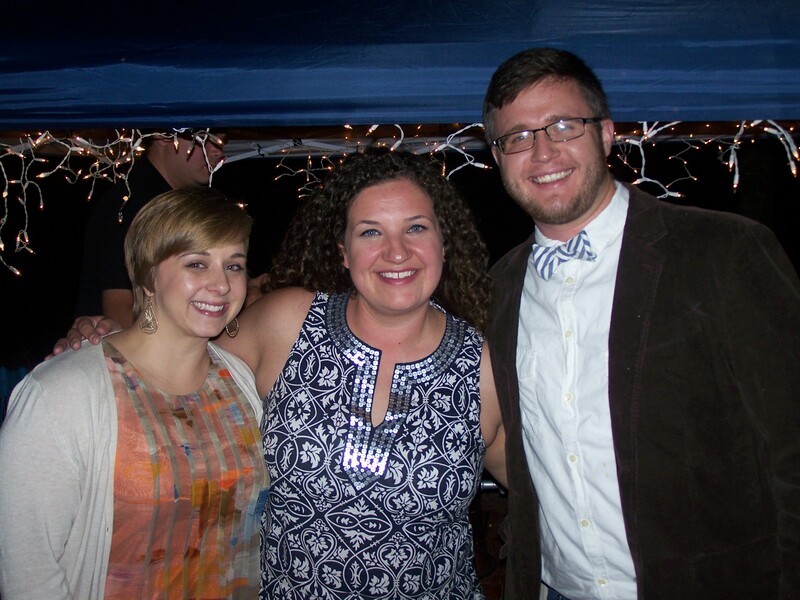 I was celebrating the last year in my 20’s, and I was ready to have one dang good party. Check out my video to see us cooking, but be forewarned, we are not professional videographers, there’s a lot going on and I was really excited…LOL! For weeks, I anticipated the celebration keeping in mind simplicity, coastal inspiration and rustic elements. 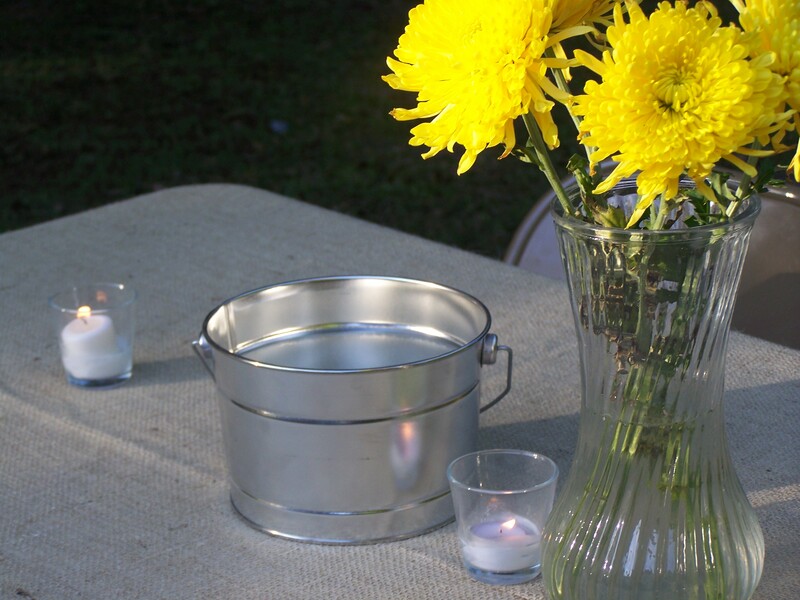 I covered the tables where guests would eat with burlap, then placed silver pails on top for discarding shrimp hulls. 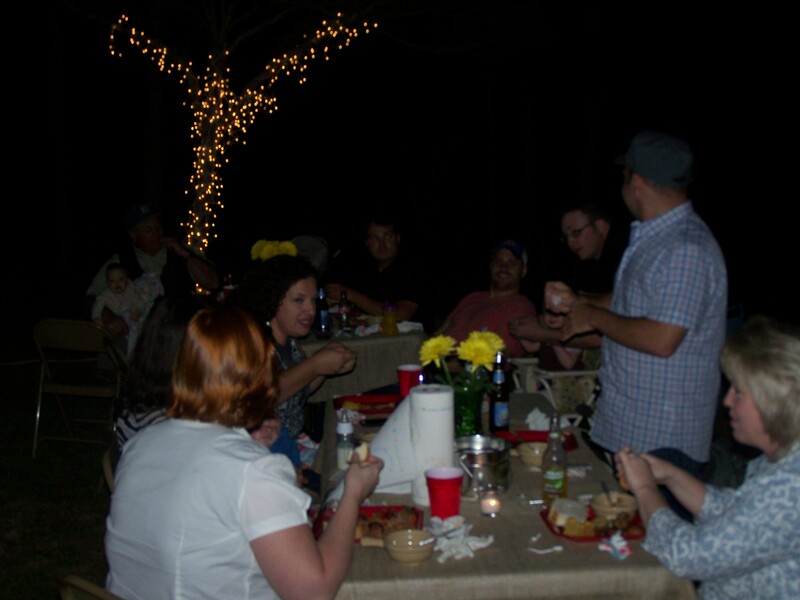 Yellow flowers popped, and votive candles, sprinkled throughout, illuminated the evening. 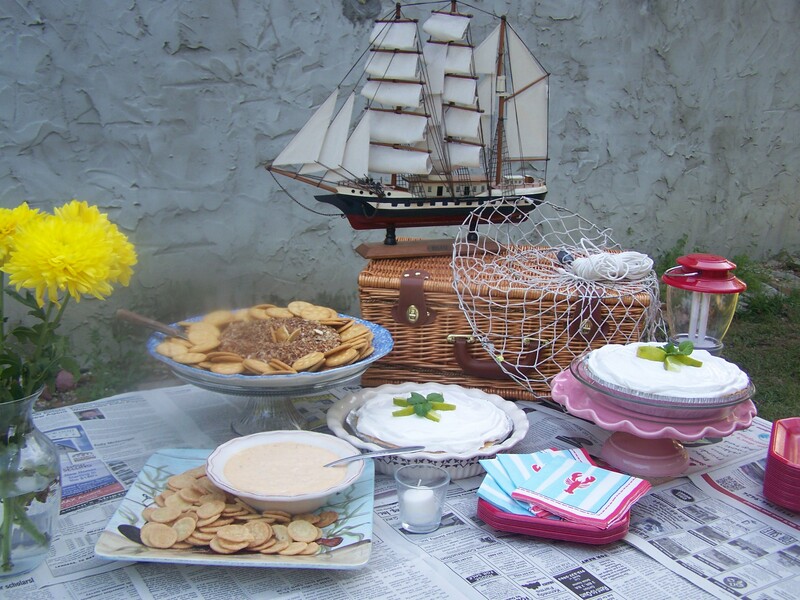 I found this nautical fabric and just had to incorporate it in the party! 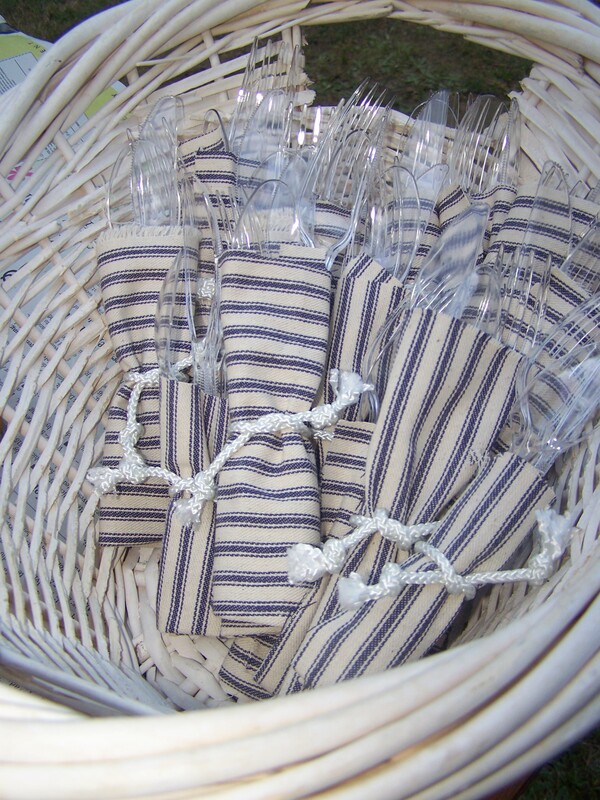 I made silverware bundles with it using rope to keep with the theme of things. It’s all in the details! If I had to think of one meal that expressed exactly who I am, without a doubt, a lowcountry boil it would be. Potatoes, shrimp, corn and sausage with Old Bay seasoning…does it get any better? Poured out on a newspaper-covered table, it’s everything I am…laid back, delicious and colorful. HA! I really can’t think of any other combination of ingredients that says “Let’s Party!” more. Much like a cocktail without a garnish, no lowcountry boil is proper without Charleston Benne Wafers. 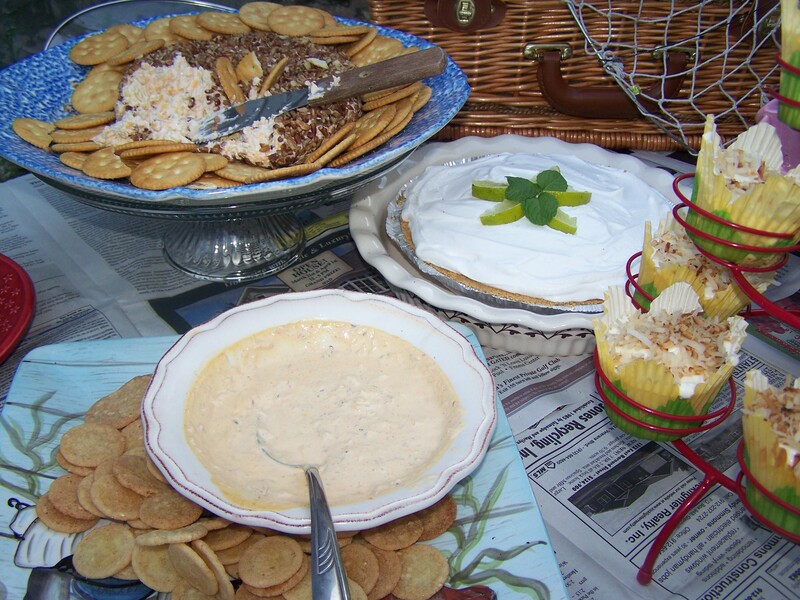 On a recent trip to the Carolina Lowcountry, I picked up some crab dip mix and a package of the popular cookie at the Charleston Market. Learn more about my trip by checking out my post, Carolina Lowcountry Classics with My Best Friend. Also pictured above: Mom’s cheese ball with jalapeno pepper and pineapple served with Ritz crackers, coconut cupcakes with coconut-cream cheese frosting, garnished with toasted coconut and lime cheesecake pies. Fresh fruit is always a welcomed dish. 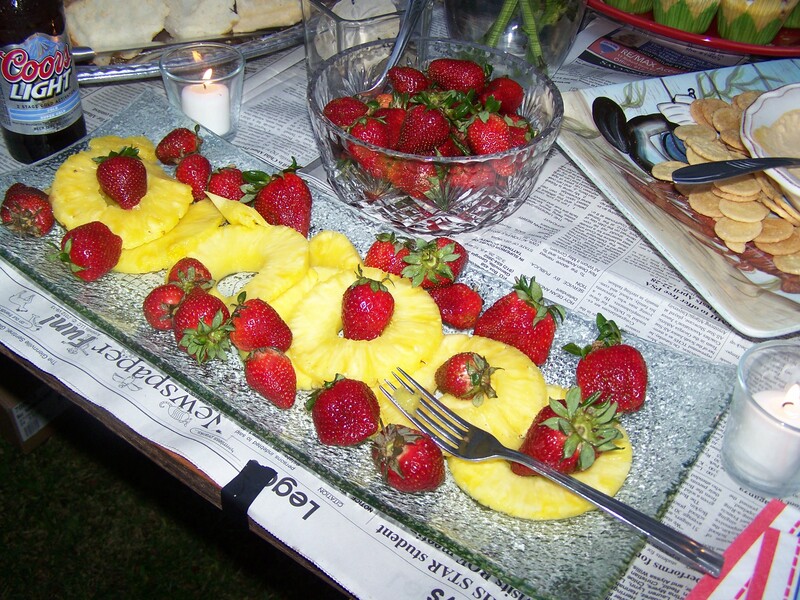 These strawberries came from The Strawberry Patch, a Mennonite Farm in Waynesboro, Georgia and the pineapple, you just gotta love it. When all the food was ready, the table looked amazing–especially combined with a yard full of friends and family, and our Bourbon and Blenheim signature cocktails. 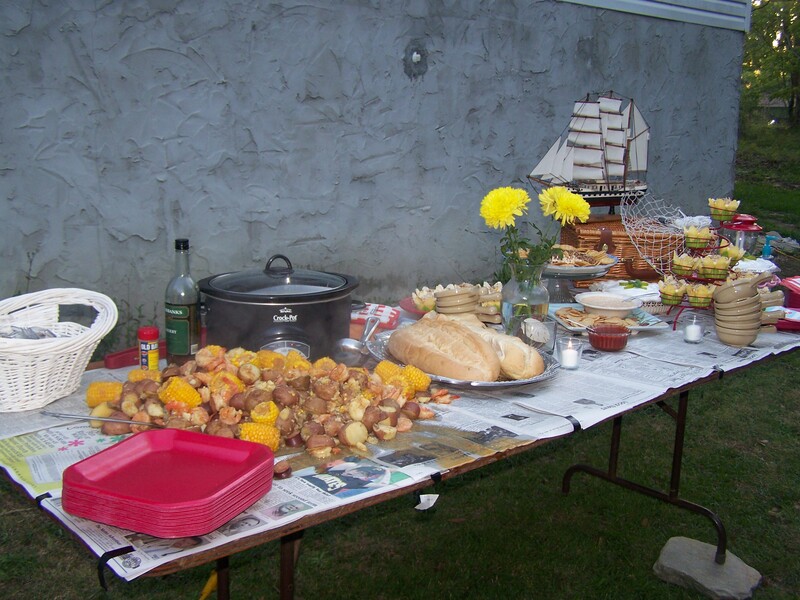 The menu also included fresh bread and my mom’s amazing crab stew made with sherry. I found the perfect bowls for serving the stew at a local restaurant supply store. 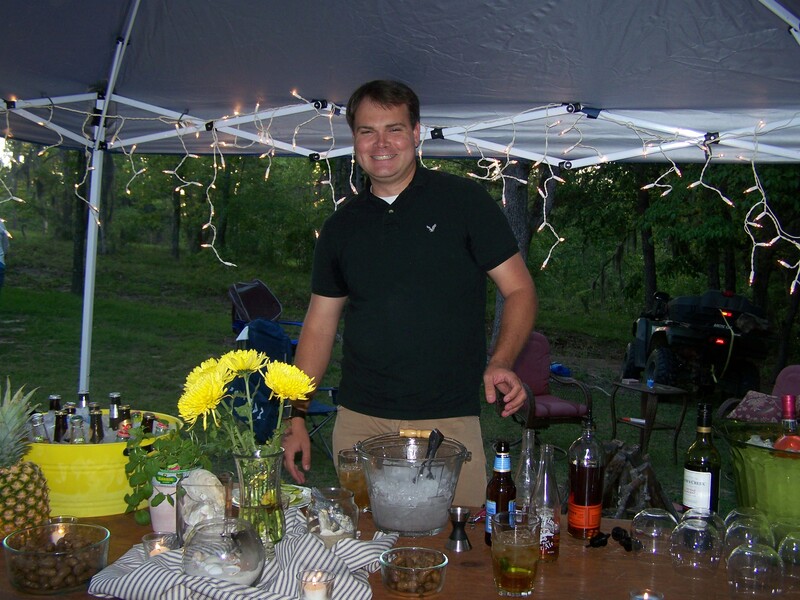 This is my good friend Patrick, and our bartender for the evening. Our signature cocktail, called a B&B featured high quality bourbon and Blenheim, a spicy ginger ale from none other than Charleston. Garnished with fresh mint, the beverage was a refreshing palate cleanser. 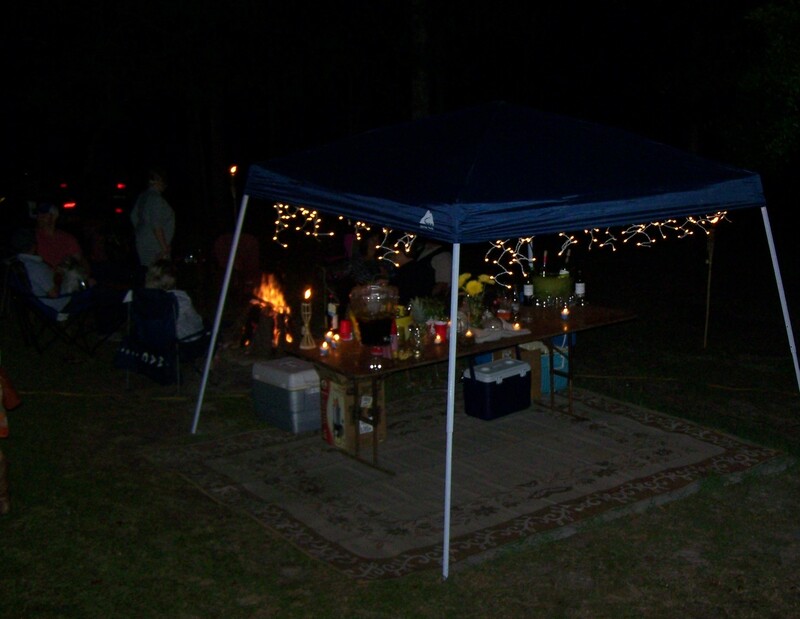 Iced tea, bottled water, Coke, wine and beer, along with boiled peanuts, also were served. Getting ready to grub down! 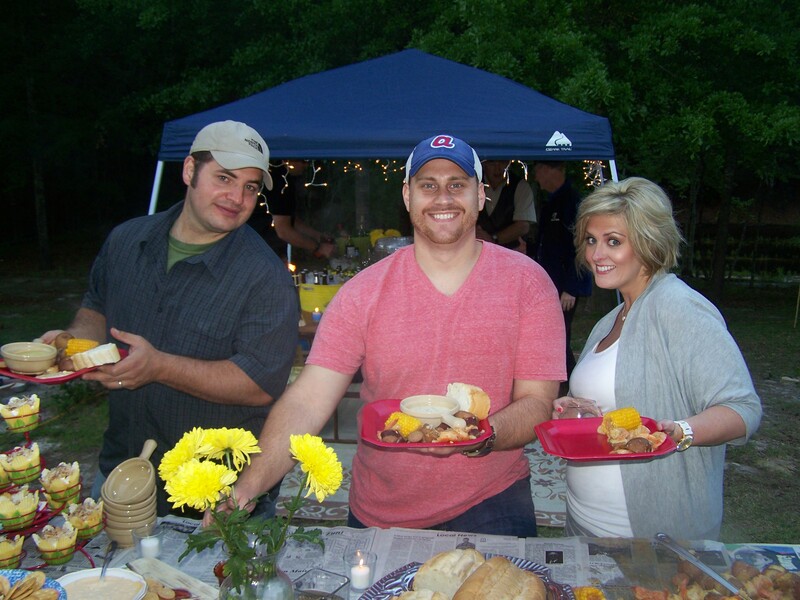 From left: My brother Joey, and my best friends Levi and Angela. A fine evening indeed. From left: Angela, me and Patrick. There’s no greater feeling than being surrounded by people you love. I’m blessed. After we ate, everyone drifted over to the fire to hang out, play guitar and sing. The weather couldn’t have been more perfect. 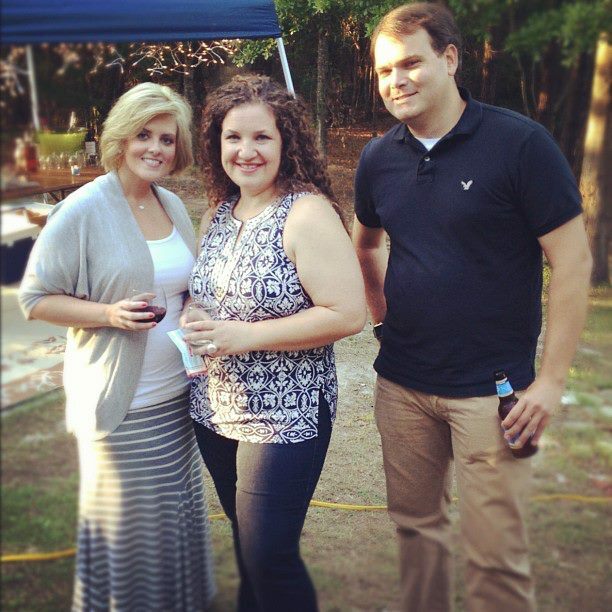 My fabulous guests and new friends Tori and John–Love them! That was one heck of a party, if I do say so myself! A GIANT thank you and shout out to my mom, dad, brother Joey and sister-in-law Sarah, and my friends Patrick, Angela and Levi for help with set up and break down, cooking, cleaning and bartending. 😉 It certainly takes a team to pull off a party like that and I couldn’t have done it without y’all! As I looked around the fire that night, I realized that I’ve had the same friends since I was 12 years old. Birthday after birthday throughout my life, they’ve all been there. In addition to that, there were new faces too and I couldn’t be more blessed. To each one that made my birthday special, I am thankful for you everyday. Now, if only I can top that party for the big 3-0! Next Lime Cheesecake Pie – Mix, Pour and Freeze! Happy, Happy Birthday! What a great party. Loved all your touches, and the coconut cupcakes. Oh my! Thanks Leigh! Those cupcakes were delicious! Love it!!! Here’s to new and great beginnings!!! Everything looks great!! And so fun! However someone is very conspicuously missing from the picture of your best friends! 😛 Next year, my sista, the big 3-0. We MUST all celebrate together!!! Thanks Ritz!! You were missed without a doubt. And yes, we will do it big for the year of our 30th!